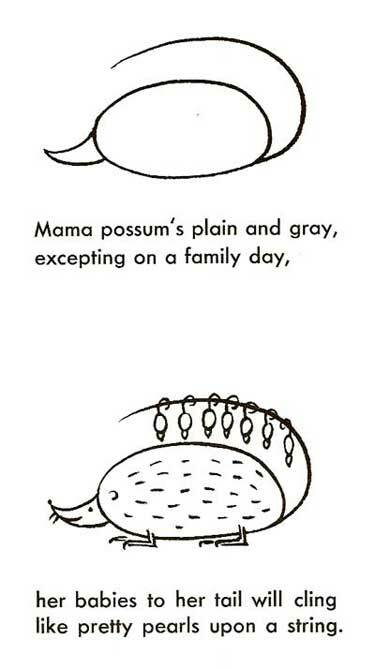 Opossums are marsupials, like kangaroos and koala "bears". Female opossums do have pouches, like kangaroos, which can hold two or three babies at a time. Opossums also have prehensile tails, which means their tails have strength, and they can control them. Though opposums are shown hanging upside from their tails sometimes, the adults actually can not do this; only babies can hang, and only for a moment or two. Opossums have other interesting behavior, including "playing dead". When an opossum plays dead they can have foam around their mouth, make their bodies stiff enough that you could roll them over, and give off a foul smell. They even roll their heads back and let their tongue loll out for added "proof". An awake opossum can hiss quite ferociously, and open its mouth to show you some rows of pretty scary teeth. While they are very interesting, I can't say opossums are terribly attractive. But sometimes having funny behaviors (some people call these character) trumps good looks.